Hello to our Bible Journal family! Last week in my small group we had a conversation about what worries us the most as parents. Many of us fear the death of a child or spouse, worry about our children being self-sufficient and positive members of society as adults, or fear our own abilities to provide for our children. Fear comes in all forms as we all know but what about the fear that our children will not have a personal relationship with the Lord? 2 Chronicles 27 and 28 are about two men, King Jotham and King Ahaz, who are dealing with the same political problems. King Jotham chooses to do what was pleasing to the Lord…..while King Ahaz chooses to ……do what was not pleasing to the Lord . King Jotham “became powerful because he was careful to live in obedience to the Lord his God”. Meanwhile, King Ahaz failed to trust God out of FEAR. Instead of turning to God, he ignored the Lords help and chose to turn to the King of Assyria for assistance and continued to reject the Lord. For the past two and a half years, my (almost 5 year old) daughter Elsa Jane, has been sleeping on a yoga mat in the floor of our bedroom. Reflecting over the past few years, I can’t help but identify with King Ahaz. 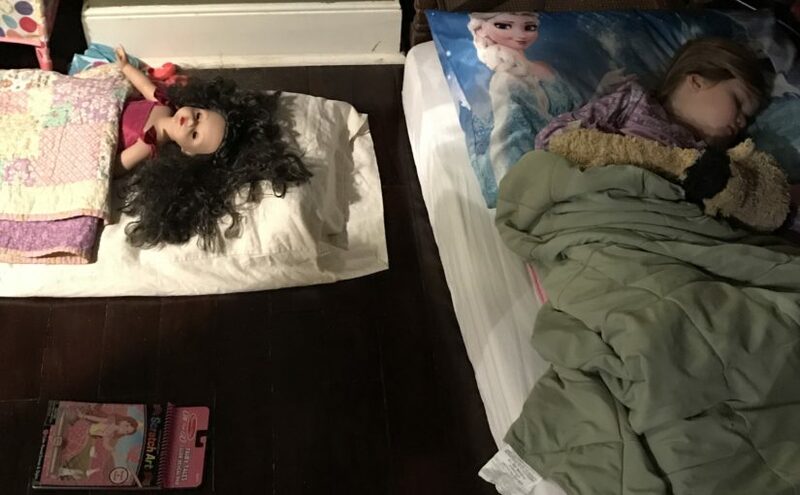 I consumed myself with fear and anxiety over my daughters sleeping arrangement and turned to “the world” for assistance. At night I would lay awake for hours worrying and creating imaginary scenarios in my head. I would spend my free time researching the internet and reading mom blogs. At play dates with other moms my conversation always revolved around Elsa Jane’s sleeping issues. I finally got to the point of acceptance. Elsa Jane was going to be in our room indefinitely. I tried everything I could. It’s out of my control and I’ll just live with it. Then, on November 22, she slept in her own bedroom the entire night! And has continued to do so for 28 days! Now that she is in her own room I have some regrets of how I chose to handle this fear in my life. I wish I had been more like King Jotham and turned to God. Instead of consuming myself with anxiety and fear every single night, I could have knelt down beside my daughter and prayed for her salvation and walk with Jesus. The hours I spent on the internet could have been replaced with hours in God’s word and praying for Elsa Jane’s relationship with the Lord. My conversations at the park with other moms could have been opportunities to share the amazing things God IS doing in my life. John 13:13 says “You call me Teacher and Lord, and it is right that you do so, because that is what I am.” I regret how I chose to handle this fear but God’s amazing grace taught me to see an area in my life where I am spiritually blind. Instead of turning to “the world,” I pray that I will live in obedience to the Lord our God and trust the timing He has for me and my family. I pray that I cast my fears upon Jesus and replace them with prayers of the salvation for my friends and family. Do you have a fear in your life you need to give to God? Who is God calling you to pray for? Will you trust Jesus to teach you how to live in obedience to Him? Previous Previous post: Undead or Alive?